Archeologists often race against the time as erosion and other forces destroy sites. At Katmai National Park & Preserve on the Alaska Peninsula, across from Kodiak Island, there is still much to learn about the history of ancient occupation along the Alagnak River. Archeological testing at a village site occupied between about 2300 and 1200 years ago reveals both details about village life and the need to monitor, evaluate, and respond to the erosional threats to this important place. In 1997 and 2001, NPS archeologists at Katmai identified and mapped a multi-component village site (DIL-161), along the Alagnak River, on the Alaska Peninsula. The site consists of a large prehistoric settlement and a twentieth century historic cabin complex. One of the prehistoric houses was about 1,800 years old, but the archeologists suspected that there could be many occupations represented at this extensive site. They noted that the river was severely eroding archeological features along the river bank. 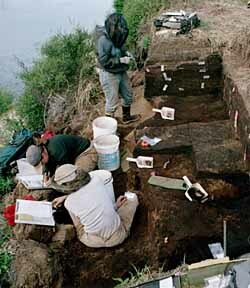 In 2004, four NPS archeologists returned to this site to conduct an intensive survey and testing program. Their goals were to define the extent of the site, identify houses and other features, determine the length of occupation, and to evaluate the significance of information being lost to active river bank erosion. The program included mapping by laser transit, testing with a soil probe to identify features and site boundaries, and excavating test units. Mapping and testing revealed that the site occupied 3.8 acres and contained 46 prehistoric and 7 historic features. Most of the prehistoric features were deep depressions that were the remains of house pits. Some of the features might also have been large community gathering places and small pits used to store food. The crew conducted test excavations inside five houses, two of which are rapidly eroding, and in two areas outside the houses. The history of prehistoric occupation along the Alagnak River is still largely unknown, but investigation at DIL-161 offered exciting details about house construction, subsistence, and village organization to contribute to an understanding of the region. The large, deep houses had central hearths, where food was cooked in pottery vessels, and were probably entered through a hole in the roof with a ladder inside. Large post holes were evidence of sturdy log construction, but trees may have been scarce at the time; building one of these houses using logs brought from outside the immediate area and worked with stone tools would have required considerable time and effort. Stone oil lamps may have helped keep the houses warm, dry, and well-lit. The thin floor deposits suggested that houses were cleaned regularly. 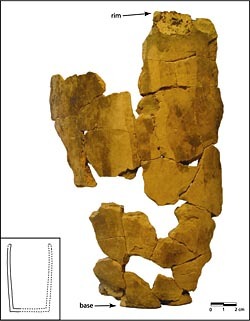 The presence of small chipped stone projectile points suggests that villagers hunted land mammals, such as caribou, as well as smaller animals. Although fishing is the primary activity along the Alagnak River today, there was little evidence of it at DIL-161. Radiocarbon dates indicated that the site was occupied between about 2,300 and 1,200 years ago, a time when other people in western Alaska began fishing intensively, yet no fish bones or evidence of fishing technologies (like stone net weights) have been recovered. Either evidence of fishing has not survived—few bones of any kind were found due to the acidic soils—or the site was occupied during a part of the year when fishing was not the focus of subsistence activities. Many questions remain unanswered about the people who lived at the site and other places along the Alagnak River. Archeologists set up monitoring points at DIL-161 to track erosion rates and respond appropriately before additional features are claimed by the river.